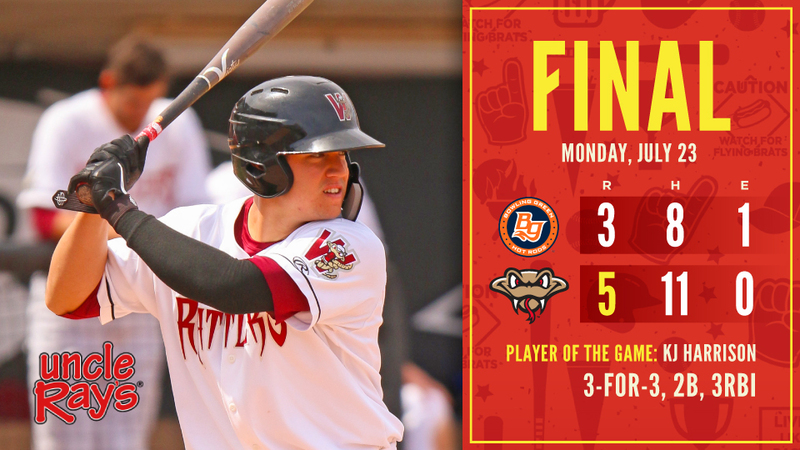 GRAND CHUTE, WI - The Wisconsin Timber Rattlers rallied from three different deficits before finally prevailing 5-3 over the Bowling Green Hot Rods on Monday afternoon at Neuroscience Group Field at Fox Cities Stadium. KJ Harrison continued his hot hitting to lead the Rattlers past the team with the best record in the Midwest league. Both teams scored in the first inning on Monday. Bowling Green scored a runner from third on a wild pitch by Wisconsin starting pitcher Carlos Herrera. The Rattlers tied the game in the bottom of the inning on a two-out, RBI single by Harrison. The Hot Rods (66-34 overall, 19-12 second half) went back in front in the top of the second. Trey Hair doubled with one out. Jim Haley was next and he punched a single to right to score Hair for a 2-1 lead. Wisconsin (45-54, 14-16) tied the game in the bottom of the fourth. Three straight singles by Trever Morrison, Harrison, and Gilbert Lara loaded the bases to open the inning. It appeared the Rattlers would leave the bases full still trailing by a run as Hot Rods starter Paul Campbell retired the next two hitters. Gabriel García didn't waste the opportunity as he evened the score with a two-out single to right to score Morrison. Bowling Green took a 3-2 lead in the top of the fifth. Taylor Walls doubled with one out and took third on a wild pitch. Walls tagged on a fly ball to center off the bat of Carl Chester and barely beat the throw home. Harrison brought the Rattlers back to even in the bottom of the fifth. Morrison, who had already extended his hitting streak to ten games with his single in the fourth, extended the Wisconsin inning with a two-out single. Then, Harrison cracked a double to right-center to score Morrison with the tying run. The Rattlers took their first lead in the game in the bottom of the seventh. Darren Seferina started the inning with a walk and took second on an errant pickoff throw. Tristen Lutz followed with a double, his second double of the game, to drive in Seferina for a 4-3 lead. Harrison added an insurance run later in the frame with a sacrifice fly to left to score Lutz from third. Harrison, who went 3-for-3 with three RBI on Monday, is 6-for-7 with seven RBI in his last two games. The Timber Rattlers received four scoreless innings from the bullpen. JT Hintzen, who earned his second win of the season, tossed a scoreless sixth and a scoreless seventh. Michael Petersen closed out the game with a scoreless eighth and a scoreless ninth for his third save of the season. Wisconsin finished the homestand 4-2 by taking two out of three games from Dayton and two out of three games from Bowling Green. The Rattlers went 16-8 against the Eastern Division this season. The Timber Rattlers are off on Tuesday. They will resume play on Wednesday with game one of a three-game series against the Peoria Chiefs at Dozer Park. Christian Taugner (6-6, 3.32) is the scheduled starting pitcher for Wisconsin. Angel Rondon (2-0, 2.63) has been announced as the starter for the Chiefs. Game time is 7:00pm. The radio broadcast is on AM1280, WNAM starting with the Potawatomi Hotel & Casino Pregame Show at 6:40pm. The broadcast is also available on the Tune In and IHeart Radio apps. Subscribers to MiLB.tv can watch the game over the internet.